Do you have time on your hands? 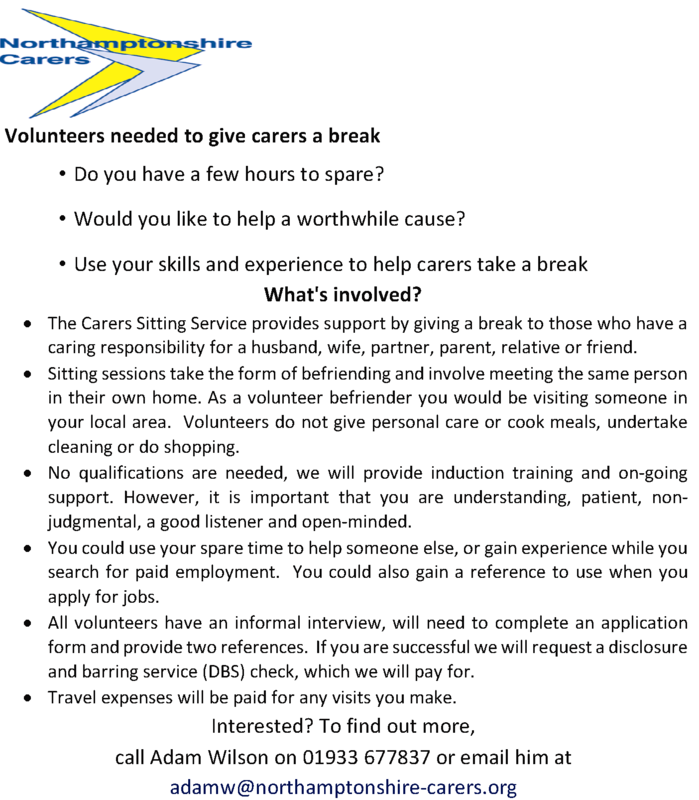 Ever thought of volunteering then perhaps you might find one of the following to be of interest to you. Northamptonshire Association for the Blind (NAB) a countrywide independent charity helping people with sight loss, is appealing for volunteers this January. The charity hopes to recruit individuals from across the county to assist with a variety of volunteering roles that will make a big difference on the lives of blind and partially sighted people living in Northamptonshire. Northamptonshire Association for the Blind’s services are funded by voluntary donations and needs support from volunteers to maximise its services for blind and partially sighted people. Whatever time you can spare to help would be greatly appreciated, be it one hour per month or one day a week. You don’t need any previous experience to volunteer with us - just a willingness to help out and get involved with your community. Volunteering can offer you the chance to learn new skills, use your existing skills and expertise, develop new interests, meet people and become active in bringing about social change. The diverse nature of volunteering means everyone can get involved. You may be unemployed, retired, returning to work, or wanting to gain experience for your CV. Perhaps you would like to devote some of your spare time to helping others or to put something back into the community. Whatever your circumstances, volunteering is a fantastic way of building self confidence, developing your interpersonal skills and increasing your chances of employment. The Daventry Volunteer Centre (DVC) is staffed by a team of paid workers and volunteers and is overseen by a management committee. The DVC acts as a local infrastructure organisation for the voluntary and community sector, offering support to help build their capcity, giving funding advice and offering training . DVC promote all aspects of volunteering. The main office is located in the Daventry library and is the first port of call for anyone interested in becoming a volunteer. The office is an information point holding a wide range of information about services in the local voluntary sector. It also deals with requests for gardening decorating and DIY from elderly or disabled people and referrals from the Happy at Home Partnership and Finding your Way projects which are run from the library office.The "Brushes and Spades" and the "Daventry DistrictTime Bank" projects are located in the Daventry Welfare Foundation Building in New Street. Tues Thurs Fri: 9.30am - 1pm. If you wish to make an appointment to talk to us at any other time or have any queries then please call on 01327 300614. Get Involved with Archive and Heritage! Northamptonshire Record Office is undertaking a monumental project to improve the accessibility of all the records we hold for the county. We are looking for skilled volunteers with an interest in our work to help catalogue and preserve all of our historical assets so that they can be listed digitally. This will make it possible to make our archives accessible online, as well as much easier to locate at the Record Office itself. Volunteers play an important role for the Archive and Heritage Service. Their work supports and complements that of our paid staff. We try to match our volunteers’ skills and interests to the activities we have on offer, and provide training for the roles. Anyone interested in helping us to preserve and share our county’s history can find out more about the specific roles on the web address below or by asking at the Record Office. • Become a school governor – Every school needs a strong governing body. Join the largest volunteer force in the country and help shape the strategic direction of your local school. • Become a volunteer reading helper – Join Beanstalk, a children’s literacy charity, who work with schools across Northamptonshire and help children who have fallen behind in their reading. WRG attracts a wide range of people, from young volunteers taking part in the Duke of Edinburgh Award Scheme; to waterway enthusiasts who wish to make a contribution to restoring and preserving the system; to people who just want to get outdoors and dirty, have fun and learn new skills. Volunteers attending our activities must be aged between 18-70, but apart from that age doesn't matter, nor does previous experience. The work of a modern canal restoration volunteer is just as varied as our volunteers...it may involve traditional work such as bricklaying and stonework; or modern techniques such as piling and concreting; or it may involve the use of machinery like excavators and dumpers...or nothing more sophisticated than a shovel or a trowel. WRG is a subsidiary of the Inland Waterway Association (IWA), a registered charity founded in 1946. For more information on the WRG visit http://www.wrg.org.uk/ . Special Constables are Volunteers who play an essential role in the success of Northamptonshire Police; kindly offering their time to support Regular Police Officers, Police Community Support Officers, Police Staff and of course fellow Special Constables. Special Constables hold the same powers and uniform as that of a regular Police Officer. Our Special Constables are initially assigned to a Safer Community Team (SCT) or a Local Response Team (LRT), but Northamptonshire Police also has a number of specialist teams within our Special Constabulary . These consist of a SAC Team, who focus on reducing Serious Acquisitive Crime, OTU Team who work closely with our regular traffic team, a Rural Crime Team who focus on the more Rural areas of the county reducing and preventing crimes in these locations. We also have a Special Constables working within our Domestic Abuse Team, who work with victims of Domestic Abuse. Volunteers are the life blood of DACT. Our volunteers give up their time to support the community. These are the people that are a key factor in the success of DACT. There are many reasons why people choose to do voluntary work. Our volunteers come from all walks of life and have a wide range of personal interests. Each volunteer decides how much time he or she wants to spend doing volunteer work – it may be a few hours a week or it may be much more. Volunteers may want to support the Car Scheme whilst others may prefer to drive our Community Minibuses, some may wish to do both. Alternatively they may prefer to work in Shopmobility. It is very much a personal choice. Each of our volunteers will derive their own rewards and experiences during their time with DACT but all benefit from the satisfaction that they get from being able to help other people. Many bonds and friendships are often formed both within the DACT organisation and with the people it supports. For more information then contact DACT on 01327 701665/666 E mail daventryct@aol.com or see their website. Citizens Advice Daventry and District provides free, confidential, impartial information and advice to the residents of Daventry Town and the surrounding District. We are based on the first floor of the Abbey buildings just off the Market Square in Daventry. The service relies on a group of dedicated volunteers who give their time freely each week to help others. We are currently looking for some more volunteers. People who have some free time and are willing to learn a new skill and give about 6 hours each week. Receptionists – To meet and greet clients, take their information, see them through to the main waiting area and to carry out some other administration tasks. Telephone Assessors – To speak to clients on the countywide telephone system and help them to find the information they need. This could be referring or signposting them to other agencies. Advisers – To be part of the drop-in team to help clients face to face with information or full advice on a wide range of topics. IT support – If you have an IT background and can help with the day to day office needs relating to IT or can help with Social Media, Twitter, Facebook and the website. Research and Campaigns support – The office not only gives help to clients but runs campaigns to help influence change centrally and to influence decision makers in the future. We need support to be able to carry this out. Trustee Board Member - Local office trustee boards need people from all sections of the community with a wide range of different skills, experience and perspectives.